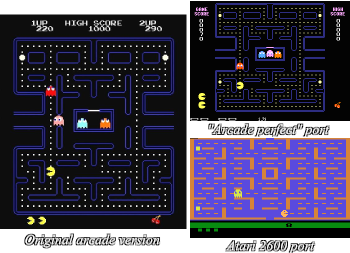 In six weeks, Atari turned Pac-Man Fever into Pac-Man Cancer. "Actual game shots taken from a version you haven't bought." Porting a program to another system is seldom an easy task. If you had the good fortune to be able to consistently use cross-platform libraries while writing the original program, you might be able to get away without having to do any code rewriting. Otherwise, you're looking at significant rewrites ahead. Multi-Platform development can help avoid this, but if the developers are rushed, the version for the system with which they're least-familiar will likely suffer. Game-Breaking Bugs only present in the port in question. Inconsistent or perpetually slow frame-rates. Ridiculously long loading times, given the complexity of the program. Poor quality visuals, audio, or controls which can't be excused by the host system's technical limitations. Clumsy controls, even if you try to forget the old control layout. For example, imitating pad control badly on a keyboard or touch screen, not supporting mice or customised control setups in a console-to-PC port, trying to cram too many hotkey functions onto controller buttons in a PC-to-console port, or forgetting entirely that a console-to-PC port even has a keyboard at its disposal. A common problem with the graphics in console-to-PC ports is the field of view: A narrow FOV that makes sense for playing on a TV on the other side of the room can and often does cause motion sickness when played on a desktop monitor. (The same reason, in fact, that console gamers are advised to sit a reasonable distance from the TV in the first place.) It's particularly an issue with first-person games. Substantial amounts of missing content, such as whole levels, playable characters/vehicles, weapons, and the like. This was frequent with ports to early Nintendo systems, certain things used to get changed around with no overall impact on quality (such as removing crosses or direct mentions of God and Death), but when the change was notable to the casual observer (e.g., "wait, wasn't there a cool hovercraft minigame between these two areas in the original version of this game? "), then it became significant. Also, keep in mind that "ports" for earlier systems may not be technically considered as ports but rather as conversions. Video game hardware of the late seventies to the mid-nineties tend to differ dramatically from one platform to another, and while that may still hold true with today's consoles, the lack of cross-platform libraries, platform-specific behaviour (the Atari 2600's video hardware was vastly different compared to the ones on the NES and arcade systems) and the generally low-level nature of programming them would account for at least some disasters. Contrast Polished Port, where a game is greatly improved during the development of a ported version and Arcade-Perfect Port, where a ported arcade game appears identical from source arcade to destination console/computer. Also related is "consolitis"; a game is designed for both PC and consoles, and suffers in the eyes of PC gamers who are used to the greater capabilities of high-end PCs. This is especially evident in franchises that began as PC games, but later installments expanded their markets; as a result, the sequel will be noticeably less refined gameplay than its predecessor. For the movie and animation equivalent of this, see Digital Destruction. Please only add examples of games that contain game-breaking bugs or are broken to the point of unplayability, not minor glitches or annoyances.